Took myself off to the National Trust at Formby yesterday. There were quite a few red squirrels about, but only on The Squirrel Walk, for those that know it. A great pose and some gorgeous light, which totally clinches the shot. They were mostly in shadow, which made it really difficult. So, I ended up waiting for one to come into some light, and got lucky! Nice capture. Thanks for sharing. 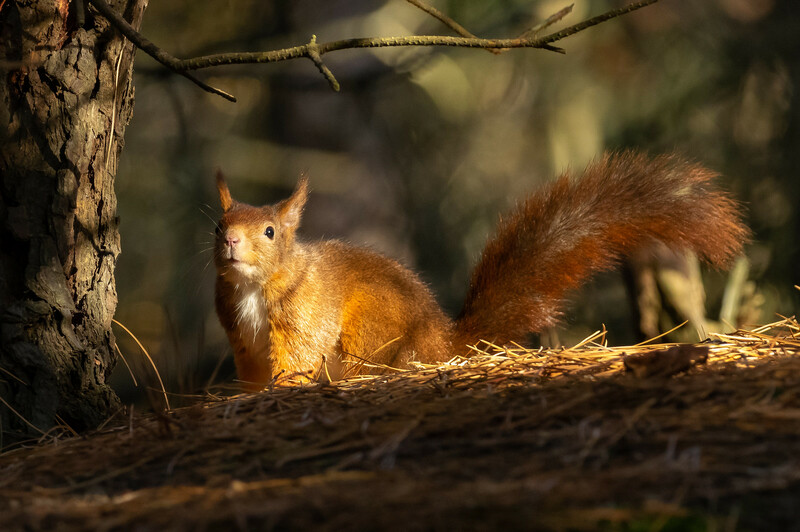 What is the Squirrel Walk? Thanks for adding that, JAK. Yes, the walk is a small walk round the area where the red squirrels are. I went on walks round a lot more of the NT site and didn't see the squirrels anywhere else. If anyone wants any more info about it that they can't find at the NT site then just ask. The lighting on that shot works a treat. I've been to both locations and there easier at Formby IMHO, I've even had them running across by boots !! They do. Or they did when I was there. Other people have been there and never seen them. The main problems where that they were nearly always in deep shadow. Or, as you say, they were often so close that it wasn't possible to take a shot!